Bitcoin Video Casino is a specialist bitcoin casino offering six exciting games with high payout rates and progressive jackpots. The site accepts deposits via the cryptocurrency Bitcoin, which gives instant deposits and withdrawals via desktop and mobile. Players can play instantly in their browser without the need to download or register at the site, while there is also a lucrative referral scheme. Bitcoin Video Casino is a simple and colourful casino offering a range of exciting gaming options to its bitcoin customers. This site is focused on simplicity with a smaller range of games than will be found at many other online casinos. In addition to this, the design is retro in style with graphics that remind us of an old school computer game. Video poker is the main focus of the site in terms of games available and this is the game offered on the homepage. 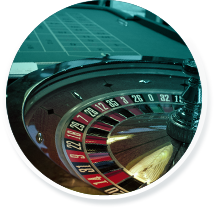 However you can click through from main menu to find pages devoted to blackjack, roulette, keno, slots and dice games. You don’t need to register to start playing at this site so this makes it highly user-friendly and accessible to all.There are no welcome deposit bonuses or promotions that players will have come to expect from online casinos, although there is a referral program allowing you to make money from encouraging other players to the site. Bitcoin Video Casino uses the cryptocurrency bitcoin exclusively as its method of payment. This means you can enjoy instant payments and withdrawals. The site is also proud of its commitment to fairness with all games ‘provably fair’ thanks to the random number generator used. More information on this claim can be found in the extensive FAQ section available from the top menu. The games at Bitcoin Video Casino are all available from the yellow main menu and there are only six options, so players who like lots of variety in terms of games and software providers might find this a little restrictive. The tagline at the top of the screen reads ‘Classic Fun for Serious Players’ so the site is mainly aiming the games at fans of classic casino games without the bells and whistles of other sites. On each games table you will find one game displayed clearly in front of you ready to play immediately. The homepage introduces a video poker game and in the FAQ section, the site says the gaming style is based on the ‘classic video poker machines in Las Vegas’. To find the other games you click through the main menu and each page has one game to play. This gives no decisions to make regarding the game however this simplicity is sure to appeal to many players. In the top menu you will find the details about the more technical aspects of the site, such as the FAQ, provably fair page, the expected return page, and details on the API and the Android app. You can also find the contact link here, giving you access to the customer service team via an email address. Unfortunately there is no live chat facility and no telephone number given. Another feature of the site is the news and users box to the right of the games screen. Here you can keep an eye on the new players joining the game and the latest big winners on other games. New players at Bitcoin Video Casino do not get to claim any special bonuses or promotions on sign up or after depositing. This is quite rare these days as most casinos offer some kind of incentive to get you to choose their site over another. It seems the commitment to bitcoin sets this site apart and we could imagine that the ability to play easily with bitcoin in your browser would attract enough players. Although we might expect some kind of first deposit bonus, newbies get nothing on arrival at the site apart from the ability to play using test credits. This is a nice touch and allows you to test out all the games without risking any money. For existing Bitcoin Video Casino players, there is a referral program that you can take advantage of. This means you can promote the site to other potential customers in exchange for up to a 25% of the house edge on all the bets made, where the house edge is 0.5%. No registration is needed on arrival at the site because your account is set up automatically. You will earn up to 25% of the house edge on all the bets made and bitcoin will be depositing into your account daily. All you need to do to bring in the cash is to keep referring new plays to the site. You are given a referral link and you can paste this into your website or blog to promote Bitcoin Video Casino to your visitors and readers. The more players you refer the better the percentage cut of the house edge you will get, starting at 5% for less than 10 users, and rising to 25% for over 100 users. This is really the only promotion available for players at the site. It is easy to see your expected return from the top menu and this lists the RTP from all the games. You will get a base payout of 99.5% on video poker and blackjack, 90.58% on keno, 97.3% on roulette, 99.7% on craps, 99% on dice and 97.9% on slots. The progressive jackpot contribution improves your RTP with at least 99.5% available on all games, which is mightily impressive. 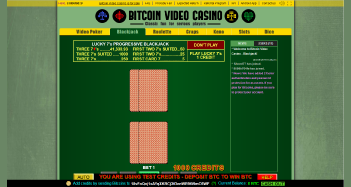 Bitcoin Video Casino offers gamblers six special games exclusively for Bitcoin players. You will be familiar with all of the offerings here, which include: video poker, roulette, blackjack slots, craps, keno and slots. As soon as you enter the site you can play straight away without even having to register. This is because you are automatically given a unique anonymous identifier using the cookies on your computer. This gives you a unique URL in your account tab allowing you to return to the site and continue where you left off. These six games is all that is available in the games collection at Bitcoin Video Casino, so if you like to play with a wide range of software providers and check out the latest video slots, then this is not the right site for you. 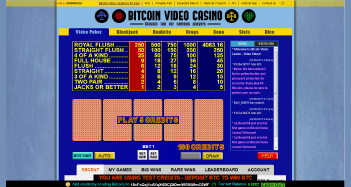 The focus of Bitcoin Video Casino is on basic traditional video poker and similar classic games without any design extras. However, each of the games does have a progressive jackpot, so this is an interesting and potentially lucrative extra addition to the regular gameplay. It is incredibly easy to starting playing at Bitcoin Video Casino and for those who want to play on the go at this bitcoin casino you can access the Android app from the top menu. Once you arrive at Bitcoin Video Casino you can play immediately using the test credits or deposit instantly using your bitcoin wallet. The cookies on your computer will enable you to keep you logged in for any future gaming sessions. If you like, you can protect your account using a password and the optional double identification system integrated into the site. So you can use it with the unique URL only, protect your account with a password alongside the URL, or type in a code sent to your mobile. This lets you protect your account in the way that works best for you. Bitcoin Video Casino is a true Bitcoin specialist and it is not possible to deposit money into your account using anything other than this flexible cryptocurrency. As soon as you arrive at the site you can begin playing using the automatic test credits, so it is easy to get started practising and enjoying all the games. As soon as you want to deposit real money you can head to the cashier and use your bitcoin account to make an instant payment. No confirmations are necessary as your bitcoin wallet transaction will be detected straight away and your account will be credited instantly, making this a smooth and trouble-free method of payment. At the bottom of the site you can see a black bar with the words: ‘Add credits by sending bitcoins to …’ and a bitcoin address. You can use any bitcoin wallet to make payment and as soon as you have sent the bitcoin your account will be credited. You can hover over the address with your mouse to get the QR code to scan or simply tap the bitcoin address on your mobile to go to the bitcoin wallet app. The site explains everything related to making deposit in the FAQ section. It also explains the withdrawal process which is just as simple as the deposit process. You have to click the green ‘cachout’ button on the black bar at the bottom of the screen and fill out the destination address, followed by ‘withdraw’ which should just take a couple of seconds. You can only withdraw funds if you have already had two deposits and you will also have to pay a withdrawal fee of 0.0001 BTC. Bitcoin Video Casino gives you a great opportunity to play all the games on your mobile device using the app. Head to the Android app link in the top menu to get the instructions on how to get started. When playing on desktop you can use the instant play software in your browser to easily play without download. To play on mobile, simply scan the QR code given on the screen or tap with your mobile to get the direct link. The app supports video poker, blackjack, dice and slots but there is no roulette or keno option in place yet. The site’s app integrates with your bitcoin wallet allowing you to easily deposit and withdraw bitcoins. You can also cashout by scanning the QR code related to your bitcoin address. It is possible to use the exact same account on your desktop and mobile device by importing your web account using the ‘settings’ tab in the app. 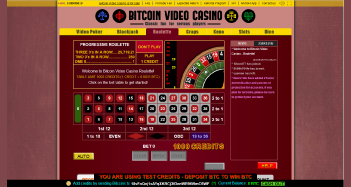 Bitcoin Video Casino is an attractive and simple bitcoin casino site, which offers players a basic range of casino games available instantly on desktop and mobile. The immediacy of the site will be highly appealing to many players with no need for downloads or even registration. This innovative design is great for casual gamers and for those who like dipping in and out of the action. Although there are no promotions or bonuses, the referral scheme gives a way to make some money on the side. The excellent house edge also means you can expect a relatively high payout percentage compared with most other online casino sites. The design of Bitcoin Video Casino is simple and those who like sophistication may find the graphics too blocky and the gameplay too basic. But for players who enjoy the old-school fruit machine appearance, this could be ideal. The site developers have gone to some trouble to explain how it all works in the FAQ and many help sections at the top of the page with game rules also available on every game page. As this is a bitcoin-only casino, this is certainly one of our top recommended Bitcoin casinos for players looking for retro design with instant play and mobile-friendly games.